O manuscrito da versão original das aventuras de Alice – Alice’s Adventures Under Ground -, com ilustrações do próprio Lewis Carroll, encontra-se agora disponível integralmente na British Library. 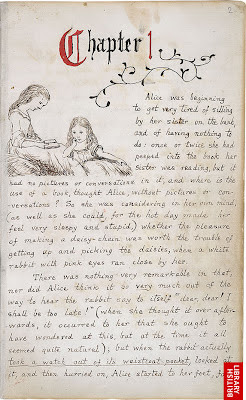 This manuscript - one of the British Library's best - loved treasures - is the original version of Alice's Adventures in Wonderland, by Lewis Carroll, the pen-name of Charles Dodgson, an Oxford mathematician. Dodgson was fond of children and became friends with Lorina, Alice and Edith Liddell, the young daughters of the Dean of his college, Christ Church. One summer's day in 1862 he entertained them on a boat trip with a story of Alice's adventures in a magical world entered through a rabbit-hole. The ten-year-old Alice was so entranced that she begged him to write it down for her. It took him some time to write out the tale - in a tiny, neat hand - and complete the 37 illustrations. Alice finally received the 90-page book, dedicated to 'a dear child, in memory of a summer day', in November 1864.